The four will be honored at a special dinner on Friday, June 1 and also the next day during the commencement ceremony. Tickets to the dinner can be purchased online through the Partnership Plan. Read more about our Distinguished Alumni on our website. The primary purpose of this study is to enable the district to be proactive in long-term facilities and enrollment planning and decision making. New housing developments and births are on the rise in the south, while birth rates are declining in the north. Schools in the southern part of the district are nearing capacity, and continued growth and/or increases in market share will require more space in those schools than is currently available. The school board will discuss the study in more detail at a future work session. Stillwater Area Public Schools has been recognized by the Stillwater Gazette with three Readers’ Choice Awards. Each year, the newspaper polls its readers on the “best of” in the St. Croix Valley. 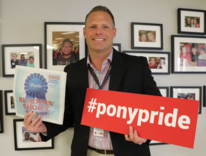 Oak-Land Middle School principal Andy Fields was named best principal, Stillwater Area High School was voted best public school, and the Rutherford PTA won best Parent Teacher Association. Congratulations! 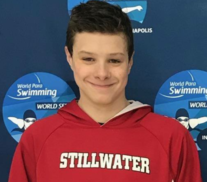 Stillwater Area High School freshman Thomas Watry has earned a spot on the Emerging Paralympic Swim Team USA! Watry competed at the World Para Swimming World Series in Indianapolis over the weekend. His time of 4:56.46 in the 400 meter freestyle earned him a spot on the national team. Watry made it to the finals in all six events he swam, recording new personal best times in each. Watry is a right leg above knee amputee. He swims mainly against abled bodied swimmers with the SAHS Boys Swim and Dive Team and the St. Croix Swim Club. Juniors Torianna Eckles and Erin Wurgler were chosen along with Jack Batterton, Abdul Mohamed and Emanuel Kassie. The programs are sponsored by the American Legion and American Legion Auxiliary. The intensive week-long program teaches students how government works, while developing leadership skills through real-world activities. Nearly 800 students from across the state will participate in the two events, which will take place in June. Read more. The Stillwater Choir performed around New York City last week, including at the historic Apollo Theater in Harlem. Eighty-one students took part in the annual tour along with ten chaperones. 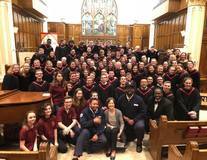 The choir also performed at the United Nations International School in Manhattan, Herricks High School in Long Island, had a clinic with Ira Shankman director of choirs at NYU, and performed a concert at St. John’s Lutheran church in Nazareth, Pennsylvania sharing the stage with Broadway singer Roosevelt Credit. The choir received standing ovations at every venue. Photos on Facebook. 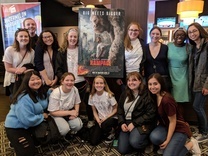 Students attend free movie screening thanks to "The Rock"
Congratulations to Stillwater Area High School junior Sydney Nelson who was named Outstanding Youth Volunteer by Community Thread! Nelson volunteers extensively at the Stillwater Public Library, Valley Outreach and Lily Lake Elementary. 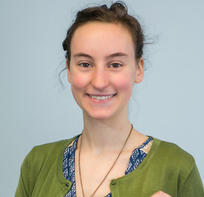 She was first introduced to volunteering in 5th grade during Stillwater Community Education's summer Adventure Club program when she participated in a community gardening project. Stillwater Middle School seventh graders celebrated Earth Day in a fun way. Students were challenged to design a project made only of recycled materials. Some of the projects include, a bench made of broken hockey sticks, a garbage garden planted in pop cans, a birdhouse made of corks, a t-shirt quilt, and other artwork made from junk. Student incorporated literature and math into the project, by interpreting a quote by E.B. White and researching statistics to back up their piece. Photos on Facebook. 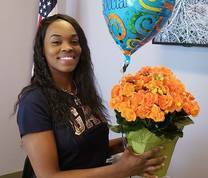 Schools across the district celebrated Administrative Professionals Week. We recognize the important work of our secretaries, administrative assistants, receptionists, and other administrative support staff, and appreciate all they do for our schools, parents, teachers and especially the students! Thank you!